Jasmine - Cottage Farm Inc. Her first foal, Tigress CFP , by Telynau Braveheart was Reserve Champpion at her NASPR Inspection. Tiggy was sold as a yearling to a prominent breeder of Welsh ponies that was starting a sport pony program. 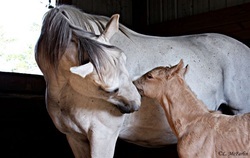 Our beautiful Palomino colt born in 2011 was sadly lost at birth. We decided to breed back to the stallion, BF Oliver Twist for a 2012. Almost a replica of his brother, Fernview Mr Bentley was born on May 4th 2012. What can I say about Bentley? I think his photographs say it best! Click on his name above to go to his page!